The most-know scripting language all set to make your business more interactive! At HK Technolab we have the optimum solution for all your business requirements. We develop the custom PHP websites, as we all know PHP is widely used open source programming language and also a strong source to develop the most prominent websites on the web. We are the leaders in the industry and with years of experience, we leverage the best PHP websites. We have the best set of developers working on this technology who deliver the right blend of creativity, quality, design and the SEO friendly websites. 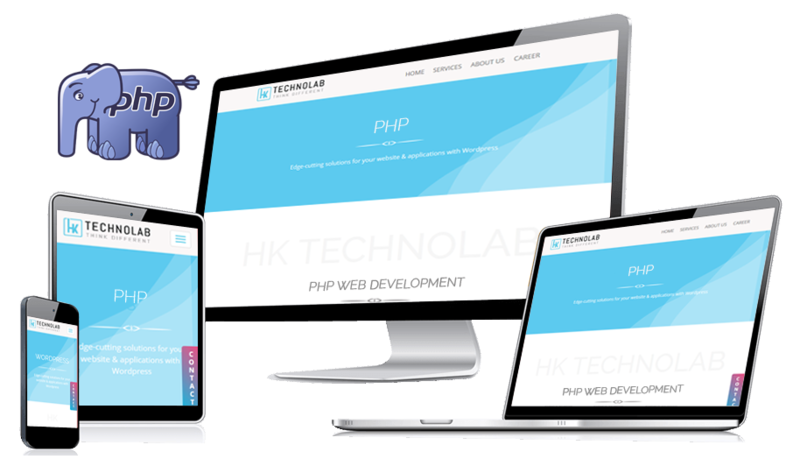 At HK Technolabs we believe in excellence and deliver the error-free website. Our customer support is available all the time to help you fix all the technicalities. Our custom PHP websites are designed keeping in mind the business requirements & mark excellence. Our trained professionals are all dedicated towards the work with a full focus on quality. Laravel is a PHP framework which follows the MVC (Model View Controller) architecture platform. It has bundles of features & easy app extensions, simplifying the web development process. An MVC framework wor be used independently, our most sophisticated Joomla Web Developers help you develop the most improved solution for your brand. We use Joomla in the most advanced way! With Codeigniter, our developers code with the most simple and elegant toolkit.With it we help you build feature-rich web applications with dynamic radical features in your website. We have the full expertise in delivering the most scalable Wordpress websites for your businesses with full WordPress theme customization, theme design, web development & plugin development. Our expert developers help you build your website with a rapid development framework called the CakePHP web development. It has excessive features and is simpler, faster and require less code to run! Zend studios have 3X faster performance, thus programmers code faster and debug more easily. With the advantage of PHP 7, our programmers provide the next-gen Zend development services. With Symfony, we help you build enterprise-level applications based on the Model-View-Controller (MVC). Our developers are skilled in handling the different Symfony development services. We help you connect all the Third-Party Application Programming Interfaces to your website or mobile application to different client group across the world. We help you integrate with the best payment gateways allowing your customers to make payment from any mode. As per site and business, we have different payment options for various clients. The developers at HK Technolabs are well informed about the latest being in technology and offer all the integration services to fulfill all your software needs. We have expertise in the SOAP API services in all languages.